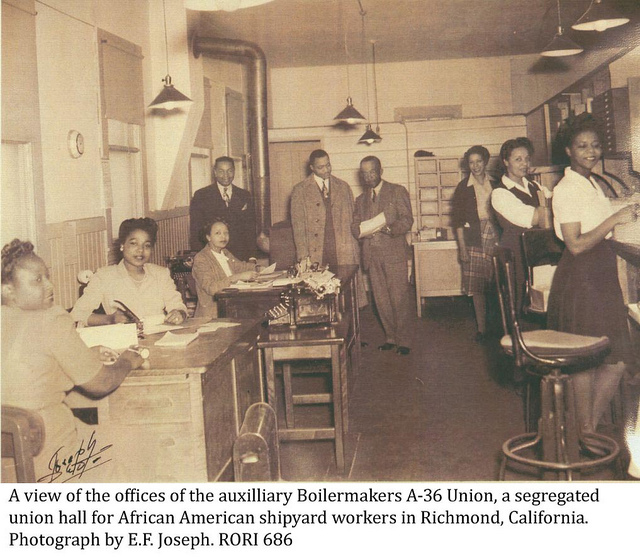 During World War II, Marin City, CA was a bustling and diverse shipbuilder's town. Today, Marin City is predominantly African American and plagued by poverty, but is surrounded by some of the whitest and wealthiest suburbs in the nation. How did this happen? The social and demographic changes of war are both far-reaching and deeply entrenched. Marin City exemplifies this demographic shift, as told through the lens of the Marinship shipyards. Marin City was founded in 1942, when housing was built for employees who worked at the nearby Marinship Corporation during World War II, building ships for the war effort. Marinship was one of many early 1940s emergency shipyards established on the West Coast to fuel America’s need for oil tankers and Liberty Ships, or war cargo ships, which, while originally a British design, were adopted due to their fast construction and low cost to produce. (1) The West Coast was an ideal place to establish the wartime shipyards due in part to its undeveloped coastline and thus plentiful space on which to build, the natural harbors present there, and its proximity to the Pacific, so the ships could be constructed and launched from the same point. Additionally, the Bay Area was well-connected to the nation’s railroads, which transported partially assembled steel parts from steel towns in the Midwest. (2) Other notable emergency shipyards included Kaiser Permanente shipyards in Richmond, California and Portland, Oregon, as well as Mare Island in Vallejo and Hunter’s Point in San Francisco. Industrial film by and about Marinship, from 1945. At 5:30 this afternoon the S.S. Escambia, the first big ocean-going tanker to be launched in San Francisco Bay for 21 years, slid down the ways at Marinship's Sausalito yard in a riot of sound with tug and Gantry crane whistles and the cheers of thousands of employees and their families all joining in. 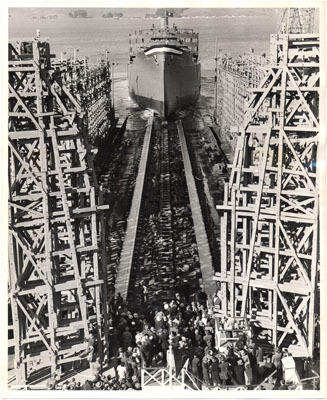 The ship was christened by Mrs. Lorraine Cooper, wife of a shipfitter journeyman, and her matron of honor was Mrs. Helen Vargas, wife of a welder foreman, while Mr. Al Gracey, Superintendent of the Hull Division, acted as Master of Ceremonies. The entire program was conducted by the workers who had built this beautiful ship - number one of the 22 tankers on Marinship's 1943 schedule. The first nine tankers are being taken over by the U.S. Navy and are being named after Indian rivers in accordance with Navy nomenclature for their ships. The photo shows the dramatic bottle-breaking, left to right: R.W. Adams, Marinship Employee Relations Manager; Mrs. Cooper, and E.B. Fox, Maritime Commission. Image: courtesy of Rosie the Riveter/WWII Home Front National Historical Park. 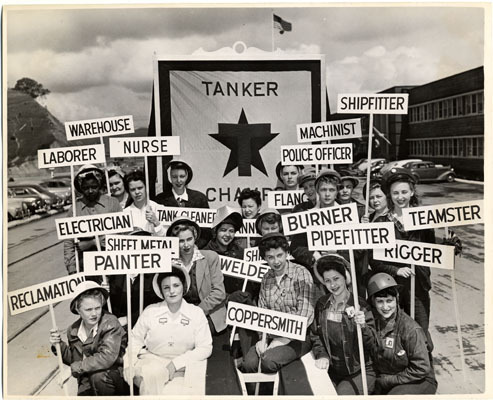 Women war workers representing twenty or more shipyard crafts at Marinship, shipyard at Sausalito on San Francisco bay, act as a guard of honor to the national Tanker Champ flag. The flag was presented to Marinship by the U.S. Maritime Commission for defeating all other U.S. shipyards in the production of tankers in March 1944. This float was a unit in a triumphal parade led by the Fourth Army Band and joined in by 5,000 workers. African Americans in Marin City also experience a lower life expectancy than the surrounding towns of Sausalito, Mill Valley, and Corte Madera. In fact, African Americans have the lowest life expectancy of all ethnicities residing in Marin, at 79.5 years compared to 83.5 years for a Caucasian person and 90.9 years for an Asian person. A person residing in Ross, one of Marin’s richest towns, has a life expectancy of 88 years, while a resident of Marin City has a life expectancy of only 77 years. Indeed, one of the biggest causes of gaps in health is access to healthy food; Marin City is easily a “food desert”, defined as “low-income neighborhoods without ready access to healthy and affordable food. Typically, convenience stores, fast food outlets, and liquor stores predominate.” (14) With the only market being a CVS drugstore and assorted fast food restaurants like Burger King and Panda Express, Marin City definitely fits this description. The nearest Safeway is over two miles away in Mill Valley, and the Mollie Stone’s market in neighboring Sausalito is prohibitively expensive. Additionally, social connections which create tight-knit communities are more absent here; many Marin City residents don’t own cars and must take the bus, which has limited stops and departure times in the neighborhood. In a 2015 Marin Independent Journal article, Julie Willems Van Dijk, director of County Health Rankings and Roadmaps program, states, “...the evidence continues to show that it’s not simply lower levels of income that affect health,” Van Dijk said. “The income divide also influences health as well. “We also see the potential for more social division and less social connectedness in communities where there is a great divide between richer and poorer populations,” she said. “And we know that stronger social connection contributes to good health within a community.” (15) Such isolation, then, also contributes to a lower quality of life for Marin City residents. While Marin City remains a more affordable place to live within expensive Marin County, its future remains uncertain. You can buy a two bedroom, one bath condo for $229,000 here, unheard of in any other part of Marin. (16) Recently, worries have surfaced that Marin City, and the affordable housing complex specifically, are targets for gentrification, which would push the low income residents out. In a San Francisco Chronicle piece, resident Homer Hall, who moved here in 1955, shares these fears, saying, “Whites wouldn’t live here [back then]. Now the White are looking at it like it’s gold - they can’t get here fast enough.” (17) Hall’s anxieties are shared by other neighborhoods around the Bay Area that are home to minorities, many of which are shipbuilder’s descendants, like in Richmond, West Oakland, and Bayview-Hunter’s Point. For now though, these residents do their best to preserve their neighborhood’s colorful history, in an attempt to keep their streets both diverse and affordable. 1. Bonnett, Wayne. World War II Shipbuilding in the San Francisco Bay Area. National Park Service. Accessed November 28th, 2015. 4. Tanker. Directed by Paul Crowley. 1945. Sausalito, CA: Marinship Corporation, 1945. Accessed November 28th, 2015. 5. Marinship Memories. Directed by Joan Lisetor. 2009. Sausalito, CA: Marin City Performing Arts, 2009. 8. Wollenberg, Charles. 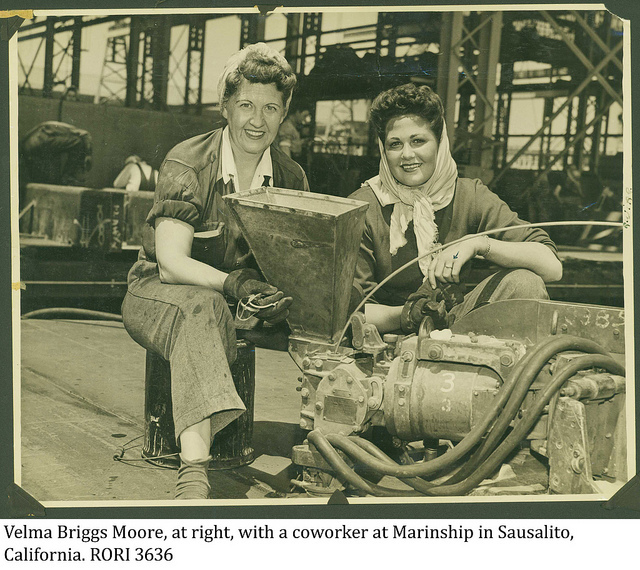 Marinship at War: Shipbuilding and Social Change in Sausalito. Sausalito, CA: Western Heritage Press, 1990. 13. Perrigan, Dana. "Marin City Looks to Better Days." San Francisco Chronicle, (San Francisco, CA) March 15, 2009. 14. Burd-Sharps, Sarah and Kristen Lewis. "A Portrait of Marin: Marin County Human Development Report 2012." American Human Development Project, 2012. 15. Halstead, Richard. "Marin Ranked Healthiest County in State for Sixth Year but Economic Inequality a Pitfall." Marin Independent Journal, (Novato, CA), March 25, 2015.